Le Soleil luxury camping site is located on the sunny, southern Argelès-sur-Mer in Roussillon. Le Soleil luxury camping site is located on the sunny, southern Argelès-sur-Mer in Roussillon. This family-friendly, spacious park is home to a California-style swimming pool complex as well as being conveniently close to Argelès Plage beach and the bustling town. For pure camping luxury, the resort offers a diverse selection of mobile home options. To check out booking availability and access other relevant information about the site, contact LUX-camp now. Welcome to Le Soleil Campsite. Why should I book Le Soleil for my camping holiday? Twin aspect of an onsite pool and convenient, direct access to beach. A California-style swimming pool area. Situated close to Argelès Adventure Centre for a range of woodland pursuits. A family-orientated fairground with various rides and attractions nearby. Le Soleil Campsite is a popular choice for families who have young children; its location offers the best of both worlds when it comes to sun, sea and sand. Not many sites are so conveniently located right beside a beachfront; it is also just one kilometre from the busy, seaside town of Argelès Plage on the Languedoc coast. The town has lots to offer by way of shops, bars and restaurants. There is a pretty promenade if you fancy a stroll, while the surrounding parkland offers peace and tranquillity. If you tire of the beach, the site is only a short distance away so holidaying families can happily enjoy both with minimum stress. There is a multitude of attractive tourist hotspots near the campsite. Banyuls is a quaint little town that is famous for its wine tasting venues; it also displays some fine sculpture pieces by the renowned artist Aristide Maillol. 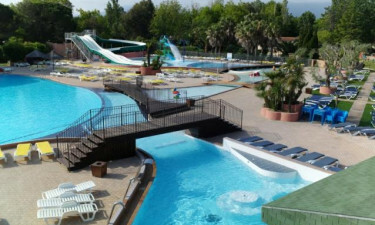 The family will enjoy hours of water-inspired fun and frolics in Aqualand at St Cyprien. 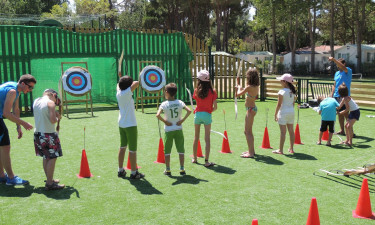 Argeles Adventure Centre is another great pick for families who enjoy organised activities in the forest. Luna Park has over thirty funfair attractions and is open in the evenings, making it a great night out for adults and children alike. 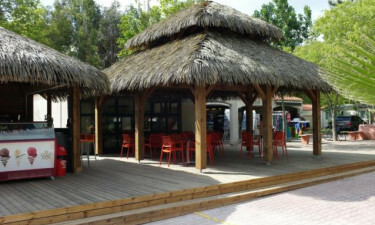 Le Soleil has a resident restaurant, Du Soleil, which is conveniently situated in the centre of the camp with terraced seating areas. There is also a well-stocked mini-market as well as a choice of two bars.